Posted in: 1 Pageant Pages, 2 Shout-out-Looks. Tagged: Eric Morley, Giselle Laronde, Halle Berry, Julia Morley, Miss World 1986, Mutya ng Pilipinas World 1986, Sherry Rose Byrne. During the darkest decade (1980-1989) of Philippine participation in Miss World, there were only two bright spots that made a Filipina shine in the UK-based beauty pageant. One such source of small joy took place last 1986 when our representative, Mutya ng Pilipinas World Sherry Rose Byrne, made it to the semifinals and was eventually named Continental Queen for Asia. In an edition that saw Trinidad & Tobago’s Giselle Laronde outlasting all comers and winning the crown, she made sure that there is enough reason to make the Filipinos back home feel proud of how she carried the name of the Philippines in London. Watch the part of the Miss World 1986 finals (spot Miss USA Halle Berry in the same) where the five Continental Queens of Beauty were officially named by the late Eric Morley (founder of Miss World) and awarded trophies by his wife Julia. 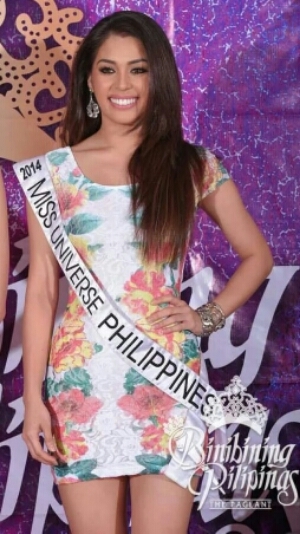 Sunday Specials: Leo Almodal for MJ Lastimosa in Miss Universe 2014? Posted in: 1 Pageant Pages, 2 Shout-out-Looks. Tagged: Alfredo Barraza, Cary Santiago, Kris Tiffany Janson, Leo Almodal, Miss Universe 2014, Miss Universe Philippines 2014, MJ Lastimosa. The age-old question “Which designer will our Miss Universe bet be wearing in the evening gown competition?” has always been asked several times, year after year, by Filipino fans and supporters. And always, the answer did not sit well with everyone. Colombian Alfredo Barraza has been providing the competition formal wears of our Miss Universe candidates for such a long time now. For the past four years alone, he may not have dressed up Venus Raj, Shamcey Supsup, Janine Tugonon and Ariella Arida with the best possible outfits that would pass muster in our eyes, but still, our bets made it all the way to the Top 5 during finals night. But as the popular quote from Heraclitus goes, “Change is the only constant in life.” And for the first time in my Miss Universe-obsessed pageant existence, I have never been so attached to that line till now. 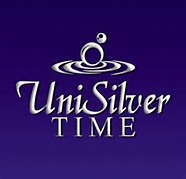 Who will she wear for Miss Universe 2014? 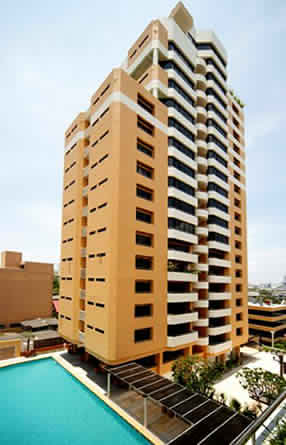 Leo Almodal or Alfredo Barraza? Talks are ripe that Miss Universe Philippines 2014 MJ Lastimosa will be wearing Leo Almodal for Miss Universe 2014 in Doral Miami come January. And the recent photos showing her wearing a flaming red number from the named Filipino designer add more fuel to the possibility. I know that BPCI is open to the possibility for as long as everything is inspected, pre-approved and perfectly-fitted for our Binibini. For example, Bb. Pilipinas Intercontinental 2014 Kris Tiffany Janson is rumored to be wearing a Cary Santiago for the finals of Miss Intercontinental 2014 next week, and that her Cebu handlers have complied to all the procedures to insure that everything will be in order. But until I see Kris walking onstage in that creation, the feeling will remain uncertain. Am I still making sense to you, dear readers? Please holler if you have anything to react about. Posted in: 1 Pageant Pages, 2 Shout-out-Looks. Tagged: Miss Supranational 2014, Yvethe Santiago. Shiny, shimmering and simple. 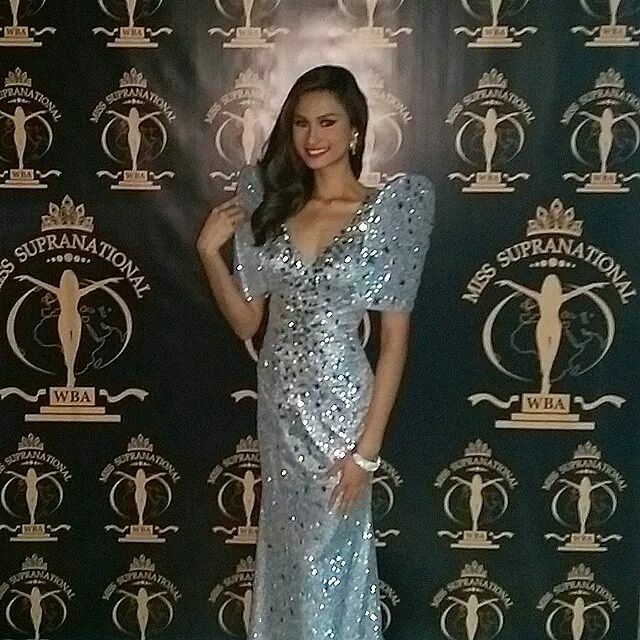 That’s how the National Costume of Miss Philippines Yvethe Santiago for Miss Supranational 2014 was presented. Far from the relatively more elaborate traditional attire worn by Kris Tiffany Janson in Miss Intercontinental 2014, this one is just a silver butterly-sleeved terno that allows the wearer to move more comfortably onstage, but really does not give much of a wow factor to talk about. Mercifully, the hair and styling remain spot on and her presence continues to be unmistakably beautiful. Posted in: 1 Pageant Pages, 2 Shout-out-Looks. Tagged: Bea Rose Santiago, Bianca Guidotti, Kesiah Papasin, Miss International 2014, PEP.ph, Rey Pumaloy. 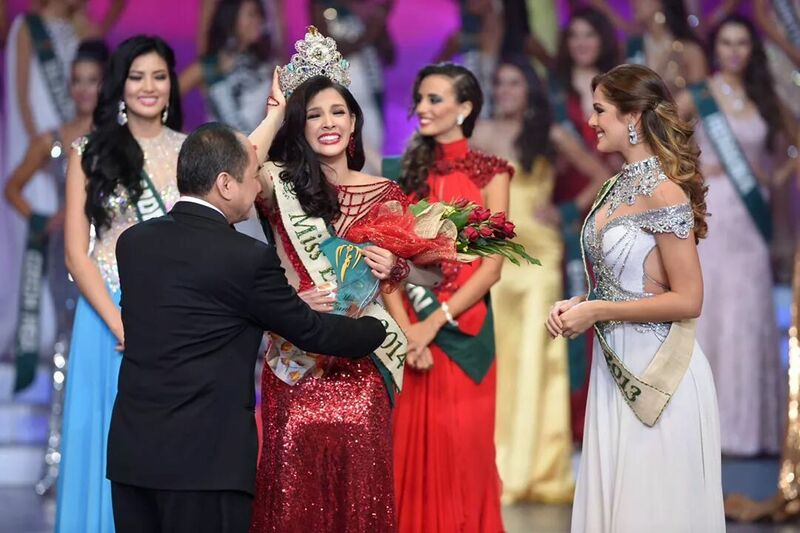 In an article written by Rey Pumaloy for PEP.ph, Miss International 2013 Bea Rose Santiago talked about the results of Miss International 2014 that did not favor Bb. 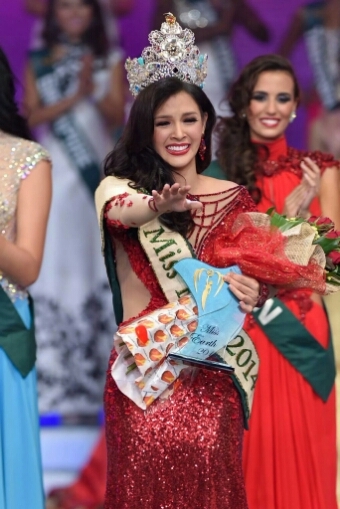 Pilipinas International 2014 Bianca Guidotti. She also touched on her role as a pageant judge and the efforts she gave in helping out our rep throughout the duration of the competition. Candid remarks were also added on how the pro-Philippines crowd during finals night might have affected the judges on the country’s performance. Be that as it may, Bianca and the rest of her fans and supporters have already moved on. But in the interest of those who would like to know a little more, I am posting below excerpts from the said article. Click on the underlined links if you want to read the whole write-up. PAGEANT JUDGE. Hindi raw alam ng lahat ng mga kandidatang kasali sa pageant na isa sa mga judge si Bea Rose noong mga panahong iyon. “But I told Bianca and Keisha Papasin the night before, during my meeting with the ambassador of the Philippines in Japan, I’m going to be a judge. “Nag-dinner kami [with the ambassador] and I even invited her. 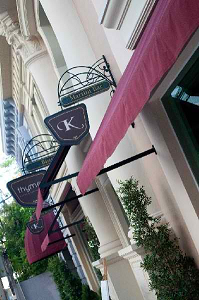 “So they were pulled out from the delegates to join us at the dinner, si Bianca at Keisha. “Parang pang-PR na rin para makilala nila si Ambassador. “So, we were there and I secretly told them what they have to do. “You know, I commended her introduction during the press presentation. “Ayaw ng mga Japanese na masyadong sweet. Gusto nila yung hand wave na makita lahat ang kamay mo. “Very elegant lang talaga, very sophisticated. 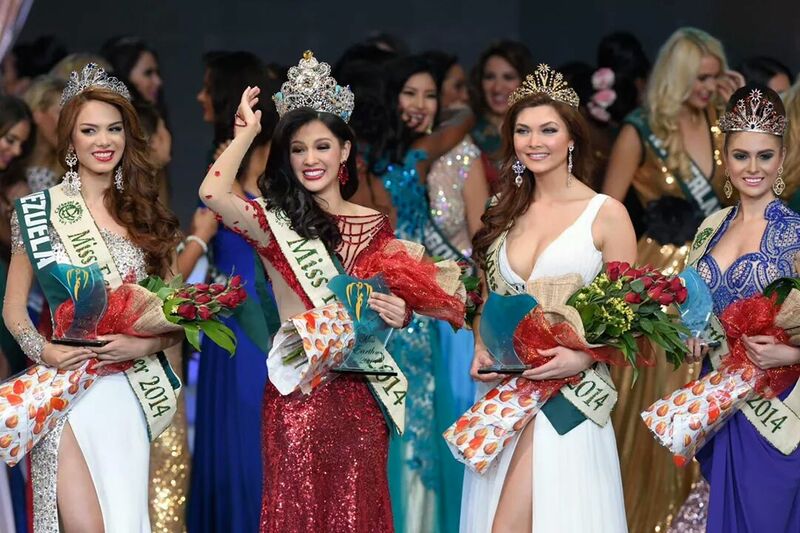 “Ang problema sa mga Japanese and Miss International, they had this very distinctive like. “Gusto lang nila simple and elegant, which were so hard to really achieve [during the competition] kasi overwhelmed ka. “And Bianca was overwhelmed at that time. I could feel it because ang daming tao for the Philippines. “Yung fans ko last year bumalik and yung family ni Bianca, Bianca’s boyfriend’s family pa, plus the Ace and Queens family. “They were all there, sobrang ingay! “At ang dami pang mga baklang mga friends ko na nandoon, sumisigaw. “Every time na sumisigaw, siyempre sobrang happy ni Bianca hindi niya siguro nakontrol. “So, siguro happy na siya at nakalimutan niyang poise pa rin. Somehow ba, doon nagkamali si Bianca? Ayon kay Bea Rose, “Pero that’s her personality. She was always happy as Binibini. 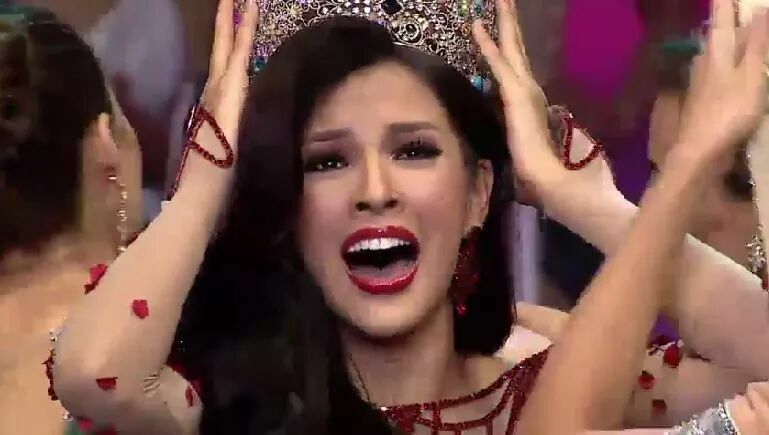 “Her Miss International and Binibini, she had the same performance. “I guess it wasn’t her night, kasi sa Top 10, we ranked five for the speech. “Yun ang mahirap, usually Top 15, e, nagkaroon lang ng Top 10. “I actually asked the Miss International organization, why only Top 10? “You know, that was the biggest… 75 girls? And only Top 10? Mahirap ‘yan. “Gusto raw kasi nila lumiit yung timeslot because last year, it was like four hours. Ano talaga ang naging posisyon ni Bianca during the pageant? Sabi ni Bea Rose, “Hindi ko nakita, hindi ipinakita. “Kasi naka-iPad na kami, it was too technical. “‘Pag after naman, we waited for the calculation, lumalabas na lang Top 10. “We didn’t have time to talk to each other. AFTER THE PAGEANT. 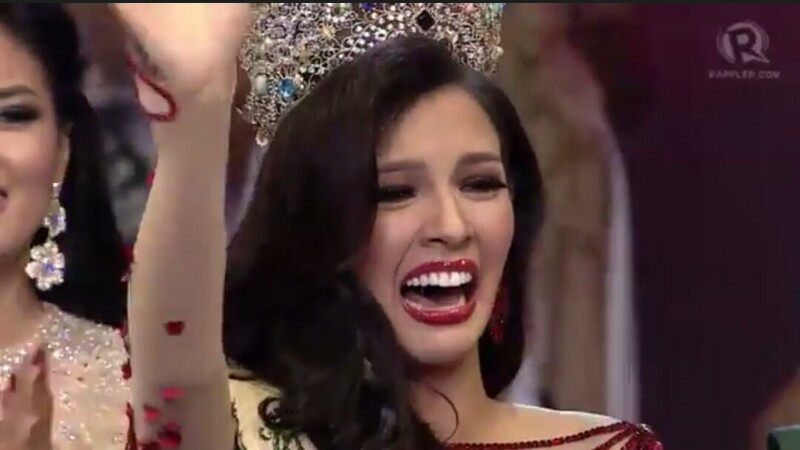 Ano ang naging reaksiyon ni Bianca matapos ang pageant? Ayon kay Bea Rose, “She was really, really sad. “It broke my heart looking at her. “She couldn’t even look at me in the eye when she was walking, patapos na yung Miss International. “Yung nagla-line up na sila with the winner and like exciting na. Yung one by one, umaalis na sila. “Bianca was crying and I wanted her to look at me. “You know, kahit mas matanda siya sa akin, I still feel like I’m an older sister. “And I somehow felt like it was my fault because I put the bar so high for her. Posted in: 1 Pageant Pages, 2 Shout-out-Looks. 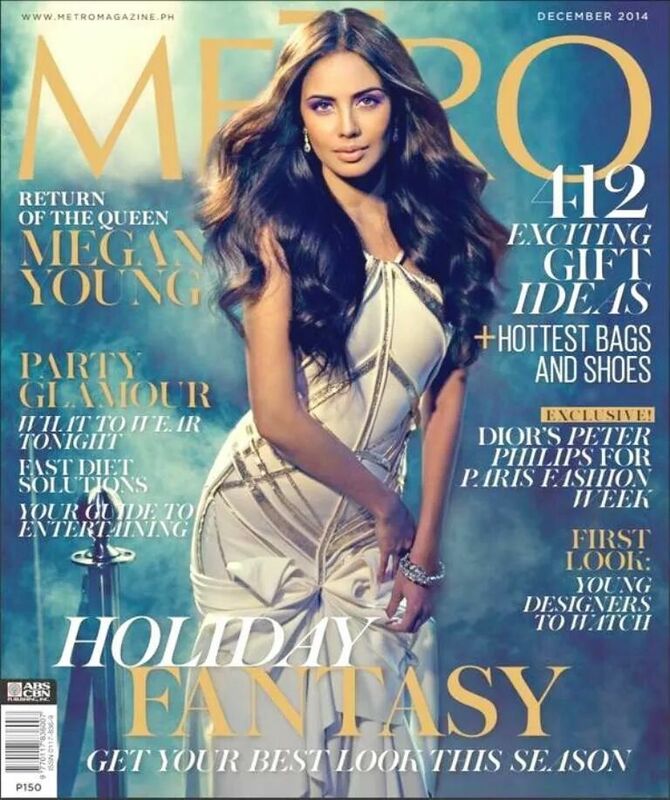 Tagged: Megan Young, Metro Magazine, Miss World 2013. Miss World 2013 Megan Young has a lot of worthwhile things to remember this coming month of December (the first day of which happens to be tomorrow). Firstly, she is once more the cover girl of Metro Magazine and in its’ Holiday 2014 issue at that. It should now be available in your favorite bookstore, newsstand and digital download source. 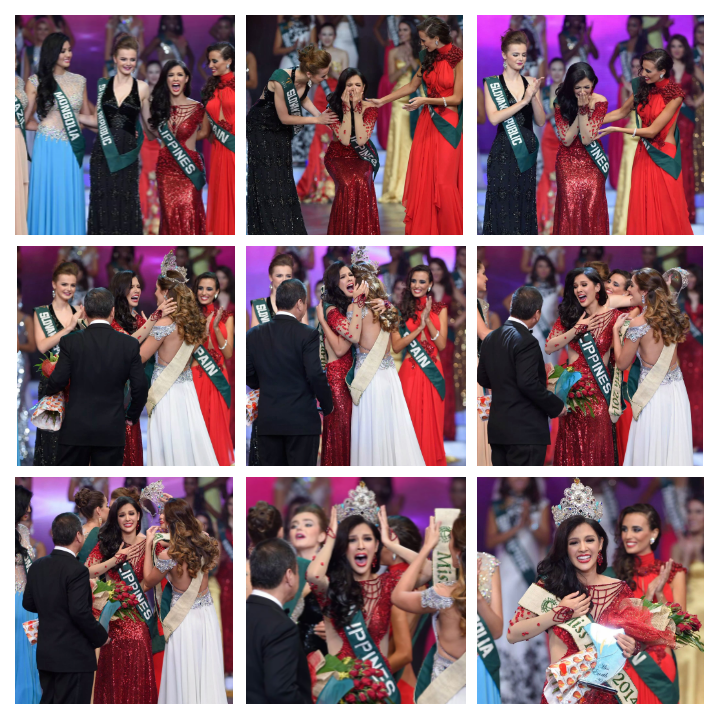 Secondly, she will be relinquishing her Miss World crown to a new successor come December 14. That’s a bittersweet thought alright. But something that would give her more time to see through all the available post-reign career options. Sure, her contract with MWO will be extended, but nothing that would prevent her from chasing other dreams in the wide horizon. 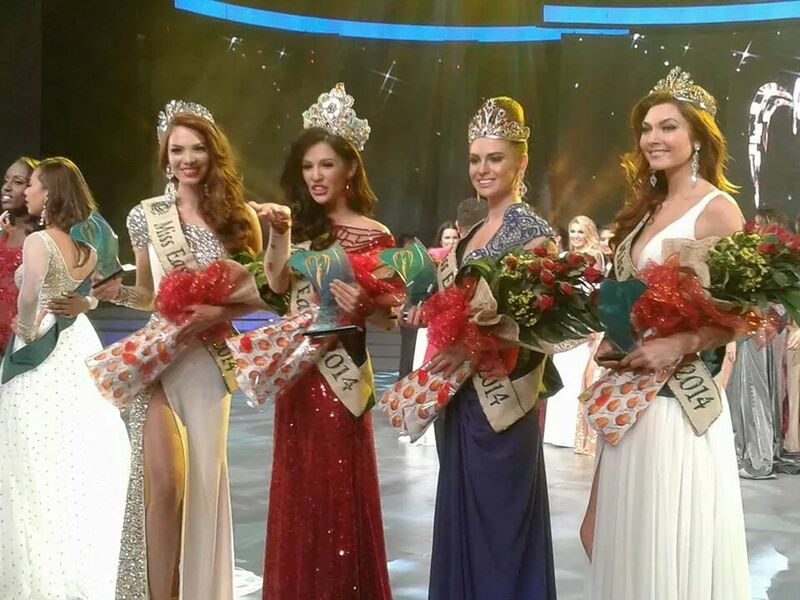 Megan (first row, center) with all the Miss World 2014 contestants. And yes, with Valerie included now. Go find.